Indietracks - an indiepop festival: Last minute reminders! 1. Tickets: weekend tickets and day tickets (Saturday or Sunday) will be available on the gates. 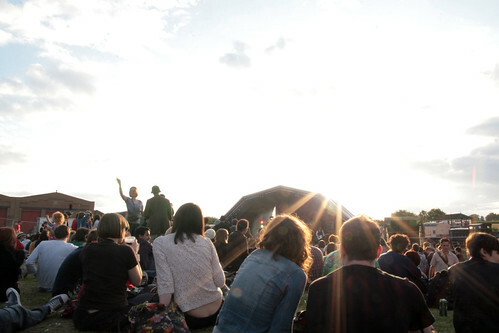 They’ll also be on sale online until at least Friday lunchtime from the Indietracks ticket page. 2. Line-up changes: We’re sad to say that Love Is All and Burning Hearts have had to withdraw from the festival for personal reasons. However, we’re delighted that Tender Trap and The Parallelograms have stepped in to take their respective places on the bill. 3. Schedule: the timeslots for the bands, DJs and workshops will be printed in the festival programme and are also listed on the Indietracks schedule page. For iPhone users, there's also now an exciting, free-to-download Indietracks iPhone App with a full guide to the festival. 4. Weather: the BBC five day forecast currently says ‘sunny intervals’ on Friday and Sunday and ‘white cloud’ on Saturday. So we guess it could rain or shine - please come prepared for sunshine on a rainy day or vice versa. 5. Getting to the site: You’ve hopefully sussed out how to get there by now, but just in case, there’s some advice on bus, rail, taxi and car-sharing options on our travel page. 6. Mixtape swap: don't forget to bring your mix CDs for the Pic’n’mixx mixtape swap. 7. Cash: There isn’t a cash machine on site, so please stock up on money beforehand. There will be real ale, fine foods and the Indietracks 2010 compilation CD all available and we wouldn’t want you to miss out! 8. Sunday quiz: If you’d like to take part in the ‘Never Mind The Pooh Sticks’ quiz at 1pm on Sunday in the workshop tent, start swotting up now, get a team together and remember to sign up in the merchandise tent before it starts. 9. Follow the festival on Twitter: we'll be tweeting during the festival @indietracksfest, so please come and follow us! If you're also tweeting from the festival, put '#indietracks' at the end of your tweet so everyone can see what you’re chatting about! 10. Enjoy yourselves and have fun! Choo choo!